I've had spicy red Thai curry sweetened with coconut and complexly spiced India curry. 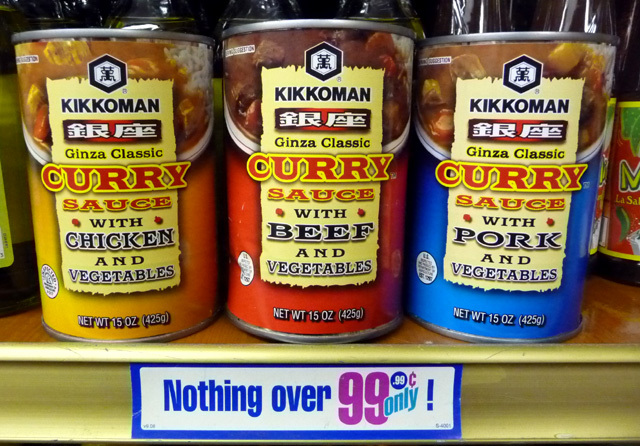 By contrast, this month's Deal of the Day is creamy Japanese Curry Sauce with Beef and Vegetables from Kikkoman. The well-known purveyor of bottled soy sauce is branching out to curry in a can -- and with this recipe, they did a decent job. My go-to meal at my favorite cheapie Japanese restaurant is a panko-crusted fried pork cutlet over rice (my recipe is here), or a hearty bowl of soba noodles. So when I happened upon this can of Japanese- style curry at my local 99c only Store, I had to try it out. The selections are beef, chicken or pork. I bought beef for this tasting test. Japanese-style curry is a comfort food, like biscuits and sausage gravy from the South. Unlike the liquid-y India or Thai curries, this is thicker, almost like Texas chili. But the pleasing flavor is the familiar cumin and garam masala, with a slight chile heat that faintly lingers. It is a tasty sauce. This bargain dish's only shortcoming is typical of packaged or canned fare -- meager meat and veggies. The chunks of beef I ran across are tender chuck, but the carrot and potato are indistinguishable from each other, from being cooked in the sauce too long. Larger pieces might have helped. 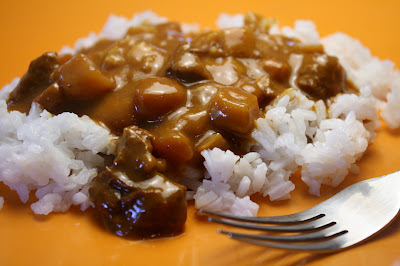 I cooked up half a cup of white rice to go with the curry, making it a filling meal. I don't think you will want to eat it unadorned like a soup. I was pleased overall, but took off a couple of points for the skimpy veggies and meat. 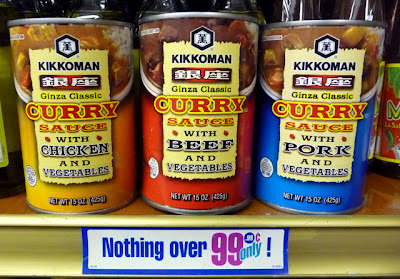 So on a 1 to 9 scale, 9 being best, I give Kikkoman's Curry Sauce with Beef and Vegetables a strong 7 ! Next, I'm curious to try the chicken and pork. 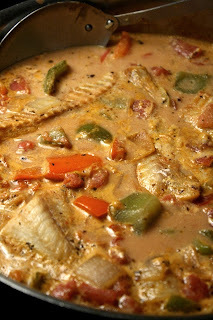 Creamy with coconut milk, this Brazilian-style fish stew is a sumptuous contrast of flavors. Also added are Fish fillets marinated in citric lime juice. Canned tomatoes, fresh chopped bell pepper and onion give crunch and body to the stew. It all comes together quickly. 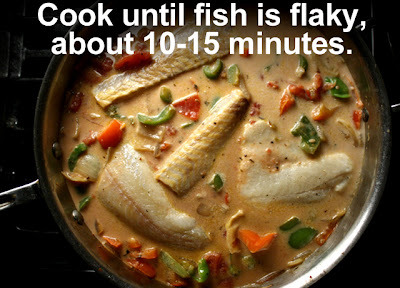 Just marinate fish in the lime juice while the stew cooks for 15 minutes, then add fish -- it's ready to serve in a few more minutes when fish becomes flaky. 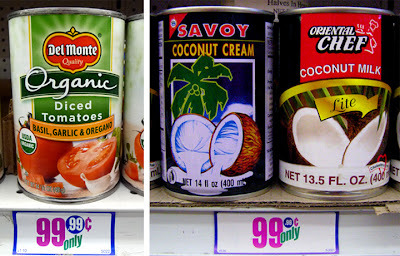 I always find canned coconut milk (or cream) at my local 99c only Store. And small packages of fish are usually carried for one dollar per 4 oz. steak in the frozen deli case of my local chain grocery store. 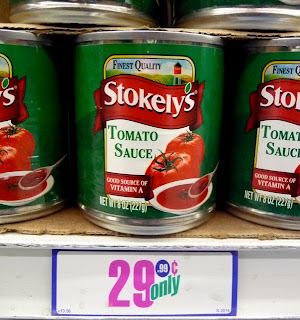 Canned tomatoes, onion and bell pepper economically fill in the other stew ingredients. 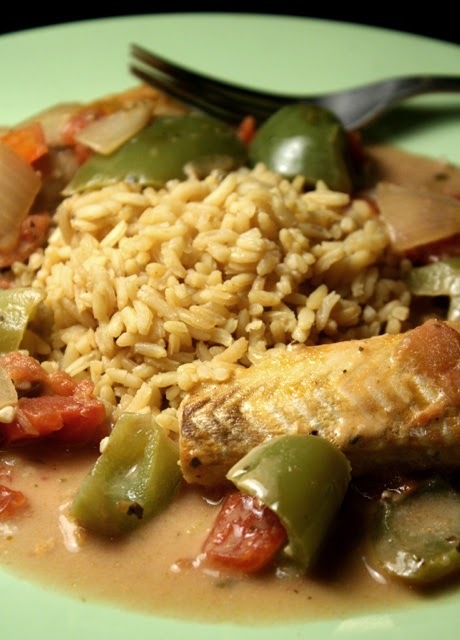 Try out the unusual melange of flavors that make up my Moqueca - Brazilian Fish Stew. 2 bell peppers - red and/or green chopped. 2 -3 small packages of fish - about 8 to 12 ounces total, or any local fish on sale. 1 tablespoon of lime or lemon juice - fresh or bottled. 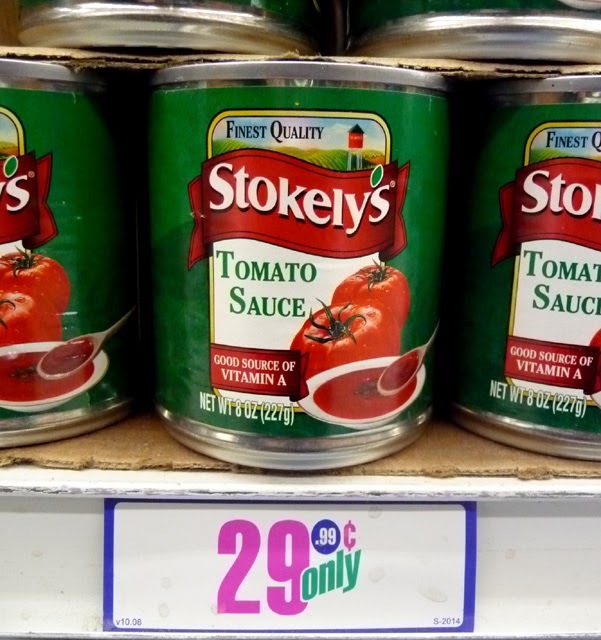 1 can of tomatoes (about 14 oz.) 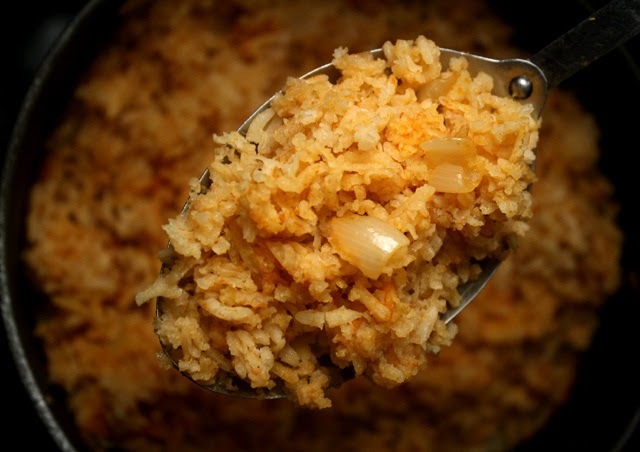 - crushed, chopped or whole (breaking it apart as it cooks). 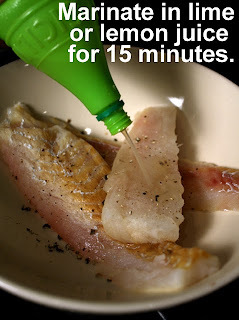 In a bowl or plate drizzle fish with lime or lemon juice. Allow to marinate for about 15 minutes while sauteing veggies and cooking stew. 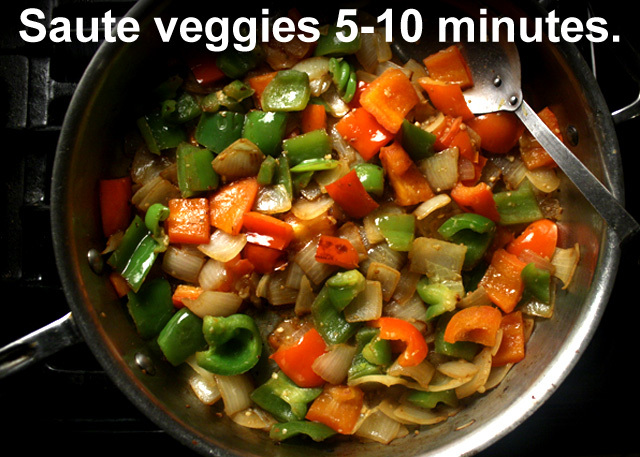 In a large pan or pot saute chopped bell peppers and onion over a medium heat for 5 - 10 minutes. 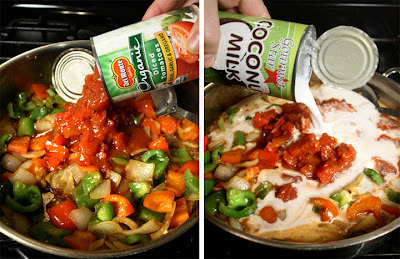 Pour in coconut milk and canned tomatoes. Bring to a boil, reduce heat and cook for 10 minutes. Finally, add fish and cook until fish is flaky and done, 10 - 15 minutes depending on thickness of fish filets. Serve over rice or anything that soaks up the sweet coconut sauce. A John Cassavetes flick is a cinematic palate cleanser. After a steady diet of predictable and anemic Hollywood film scraps it's great to dig into raw, spicy and unpredictable filmmaking. And I've come up with a pasta dish that is as fiery as one of my favorite filmmakers, called: John Cassavetes Red Pepper, Olive Oil, Garlic & Pasta. 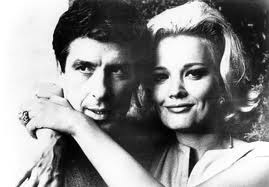 As unconventional as the 99 Cent Chef, John Cassavetes films were made on a shoestring budget just like my cuisine is! Cassavetes is a method actor with an unadorned style that matches the way I cook -- straightforward recipes stripped down, real and packed with flavor. 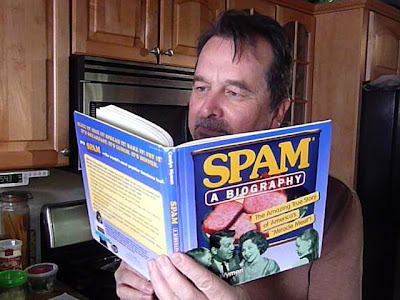 My latest dish is no phony. Scroll down past the video clips for the easy-to-make recipe. And Cassavetes freewheeling DIY aesthetic of using real locations, actor friends, minimal crew and film equipment, influences the way I do my own videos -- just click on any of the following: "L.A. Street Hot Dog," "The 99 Cent Chef Meets Pedro Pe," "Carney's Hot Dog Happy Hour" and "Bloggers 99c White Wine Tasting." 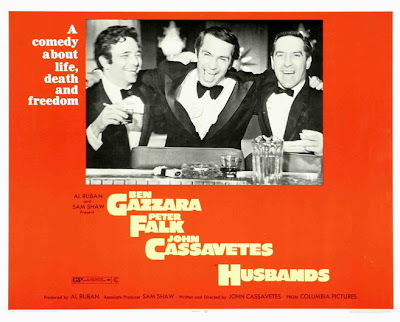 Cassavetes is a true brother of the French New Wave of the '50s and '60s. And you can see his influence on everyone from Martin Scorsese's "Raging Bull" and last year's "The Wrestler" by Darren Aronofsy, to the mumblecore film genre out of Austin, Texas. It always comes down to two characters hashing it out on the harsh neon night street, in a drab room, or over drinks at a dimly lit bar. Now is the time to bone up on the Cassavetes oeuvre at my favorite cinema arthouse, the Silent Movie Theater. Join the Chef and the rest of The Cinefamily for upcoming live appearances by Ben Gazzara ("Husbands",) Seymour Cassel ("Minnie And Moskowitz") and Gena Rowlands ("Woman Under The Influence") -- all this month! The Chef will have his camera on hand to record these raconteurs. So check back to see it all. 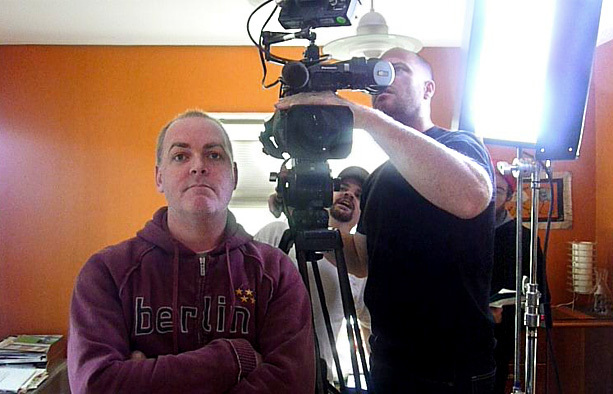 More video interview clips will be added over the next week. 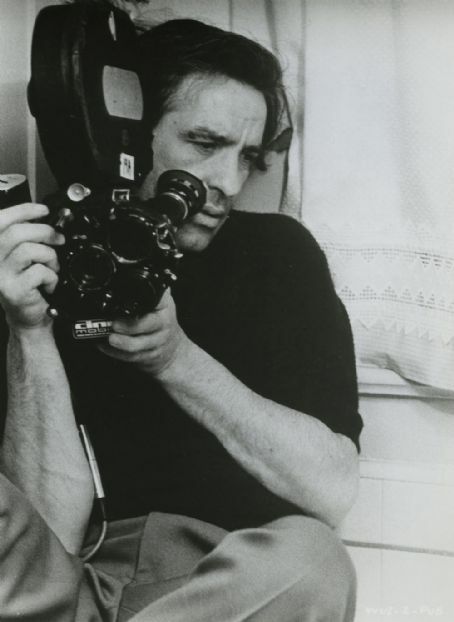 And click here for the rest of this month's John Cassavetes film schedule. If you get there before I do, save me a front row couch seat! First up is Ben Gazzara. The guy can tell a story. I saw him Saturday at the "Husbands" screening (click here for an interesting making-of documentary about "Husbands"). The movie house was packed. Watch the clip below to hear his take on acting and working with Cassavetes. Warning, Ben drops the f-bomb only once (@ 2:01,) while describing a 1968 screening of "Faces" -- he is one feisty interview. Play it here. The video runs 6 minutes, 13 seconds. 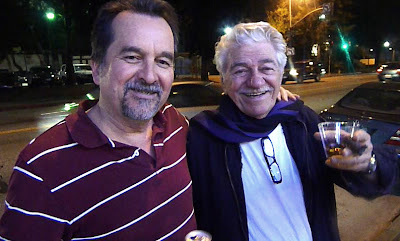 My next video is an interview with Seymour Cassel for the screening of "Minnie and Moskowitz," (trailer here.) Seymour is the most approachable fellow you will ever meet. When I picked up my will-call ticket at the Silent Movie Theater box office, he was hanging outside on the sidewalk smoking a cigar and chatting with anyone who approached. Ask one question and he is off and running, as you will see in the video. Play it here. The video runs 4 minutes, 26 seconds. Well, I've saved the best for last. My third and final video is an interview with Gena Rowlands (who was married to Cassavetes until he died from cirrhosis of the liver in 1989 at the age of 59.) All of John Cassavetes films have wild scenes, but "Woman Under The Influence" has more great scenes than any other (click here.) And Gena Rowlands rips the lead role apart, taking it places no one else dare go. 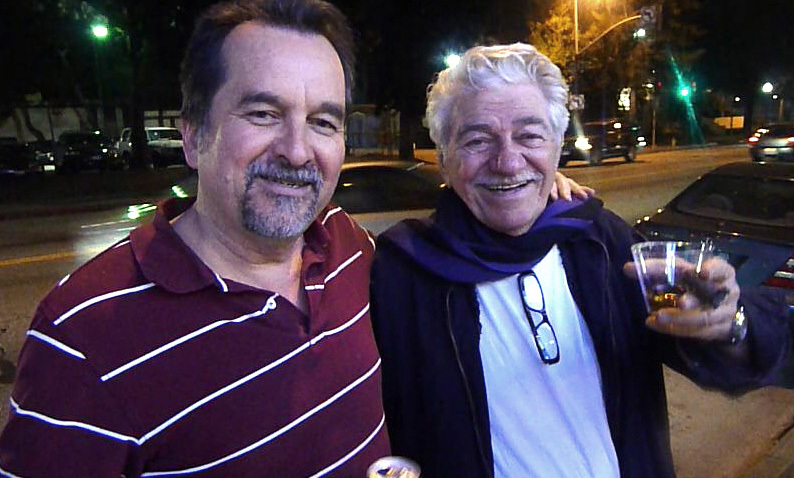 After the interview wine was served in the back patio while Gena Rowlands held court -- signing John Cassavetes dvd box sets and taking pictures with fans. It was a cool evening. So check out my last video, Gena is an excellent storyteller. Play it here. The video runs 8 minutes, 35 seconds. And now on to my John Cassavetes Red Pepper, Olive Oil, Garlic & Pasta. Simply spicy and delicious best describes my latest pasta dish. 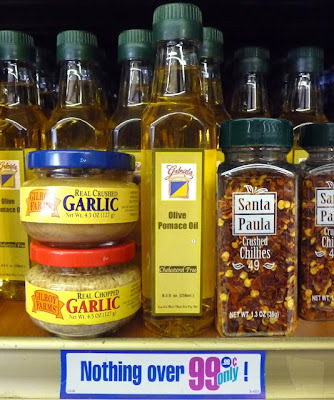 This Italian dinner table classic gets a 99 Cent Chef makeover. Normally, a handful of peeled garlic cloves are sauteed in olive oil, then thrown out -- seems a waste; I just take a tablespoon of crushed (or chopped) garlic and lightly brown it in oil. 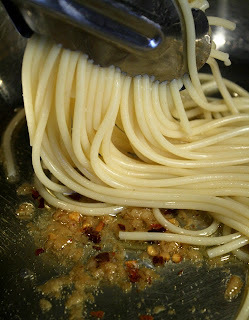 Everything else is done typically -- adding crushed red pepper flakes, cooked pasta, and finishing with parmesan cheese. This dish takes twice the normal amount of olive oil, but the addition of garlic and red pepper builds a pungent and spicy sauce. All the ingredients are cheap, just the way this chintzy chef likes it. Plus, it's so quick to do; this dish comes together in the time it takes to cook your pasta. 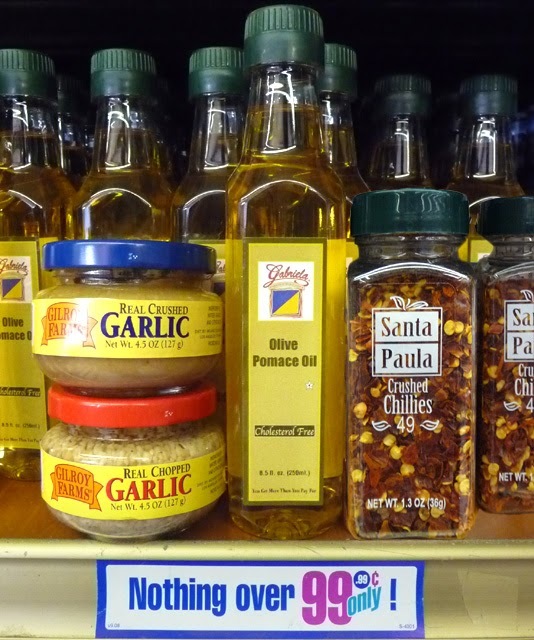 It's cupboard cuisine at its most convenient -- a jar of crushed garlic, packaged pasta, bottled olive oil, and a spice jar of red pepper flakes. A satisfying meal that's quick to prepare after a long day at the office, or on the movie set! 1/2 package (about 6 ounces) of your favorite pasta - I used spaghetti. 3-4 tablespoons of olive oil - or any tasty vegetable oil. It's time to get out the good stuff ! 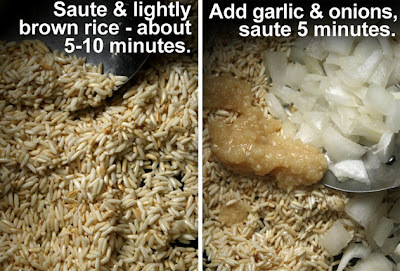 1 tablespoon of chopped or crushed garlic - fresh or from the jar. 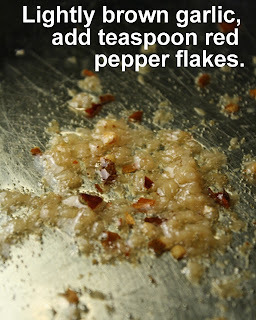 1 teaspoon of dried red chile pepper flakes. 2 tablespoons of dried or fresh grated parmesan cheese - optional. *If you have any fresh herbs on hand, add a chopped teaspoon for extra flavor. Start your pasta boiling, and cook according to package directions. I usually shave off a couple of minutes for al dente. First add crushed garlic to an unheated medium size pan (but large enough to add cooked pasta). 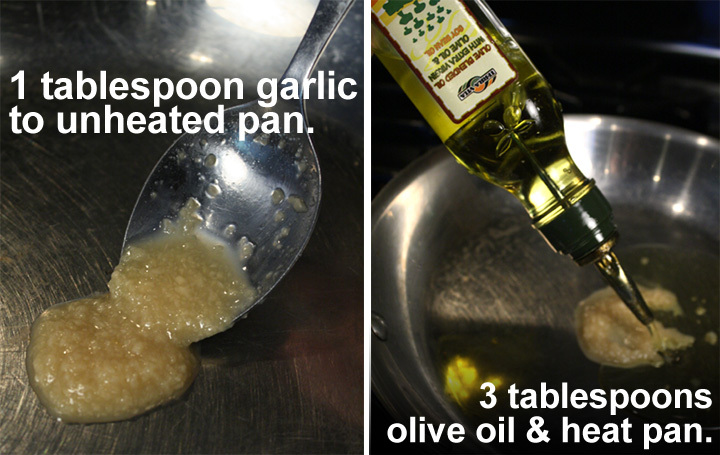 Don't add garlic from the jar to a hot pan or it will splatter and make a mess. Next add oil and turn on the heat to medium/low. 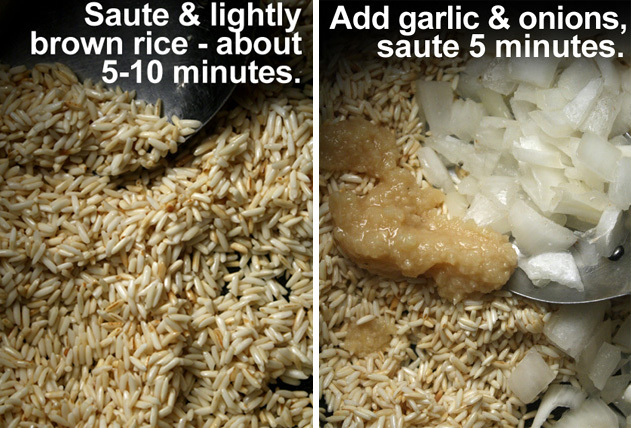 Saute garlic for about 3 minutes until it starts to lightly brown. Watch garlic closely as it is easy to burn. Add red chile flakes and mix well. Pasta should be done by now (okay to precook pasta). Mix in pasta - heat through. 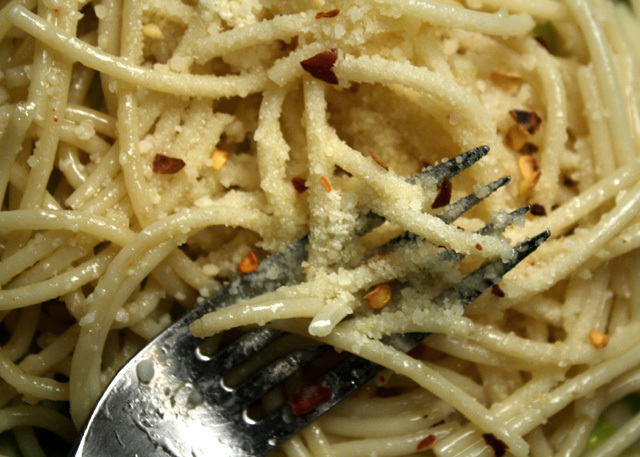 Finally, sprinkle on dried parmesan cheese (or fresh grated) and any fresh herbs you may have on hand (optional). That's a wrap! Cut, print - enjoy! Don't miss The 99 Cent Chef's nationwide television appearance on cable! 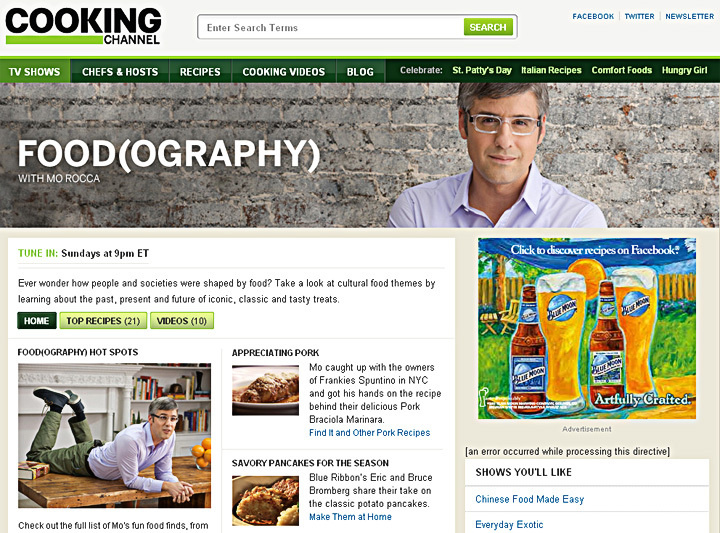 The show is called Food(ography) on the Cooking Channel, and the host is Mo Rocca. 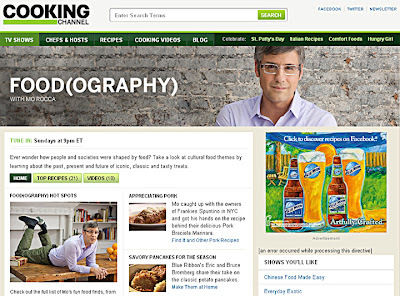 I have 2 videos below: the first is my Cooking Channel appearance, followed by fun behind-the-scenes footage. The episode is called Cheap East & Drinks and features a step-by-step video recipe of my Portabella Crab Rockerfeller (click here), plus an interview. To quote Food(ography)'s website write-up: "Great food doesn't have to be overly expensive, and to foodographists there's nothing tastier than a bargain - so count your pocket change because we're on a hunt for the best deals around. From the Brooklyn flea market for great food and finds to the 99 Cent Chef for a cheap and delicious make-at-home meal. Plus, we'll transform fast food into a fancy feast with a few tricks, grab some grub at L.A.'s oldest dive bar, and meet Emily Farris, the Casserole Queen. Don't worry about the bill! Food(ography) is picking up the tab." Play it here. The video runs 2 minutes, 36 seconds. To view or embed Cooking Channel video from Youtube click here. It was a quick and fun shoot that was done a couple of months ago. The director, Peter Fowkes, has an excellent sense of humor and played along with some of my hijinks, as you can see in this 2 1/2 minute teaser. It's a lighthearted behind-the-scenes video to whet your appetite for the real thing -- and no, canned Spam is not an ingredient in my Cooking Channel recipe! So, check out my fun backstage footage. Play it here. The video runs 2 minutes, 26 seconds. To view or embed backstage video from Youtube click here. I've had many types of breakfast burritos. A favorite is from Cactus on Vine Street in Hollywood: Mexican Eggs made with chopped and sauteed tomato, onion, red and green bell pepper. And I've made my own with sauteed chorizo and eggs (click here for my Chorizo and Eggs Breakfast Taco). Americanized versions are basic scrambled eggs with bacon, salsa and sometimes potatoes. But the most unusual one I have ever had was a Flying Burrito -- captured on video last month from my Joshua Tree travelogue. Just click here for this one-of-a-kind eating experience. Quite often, the common denominator in a Mexican Breakfast Burrito is the addition of refried pinto beans and Mexican rice. Most restaurant or taco stand burritos use huge flour tortillas. I'm lucky to finish half of one. My recipe uses typical grocery store-bought tortillas which are considerably smaller -- really just the right size. And my local 99c only Store always stocks cans of refried beans. 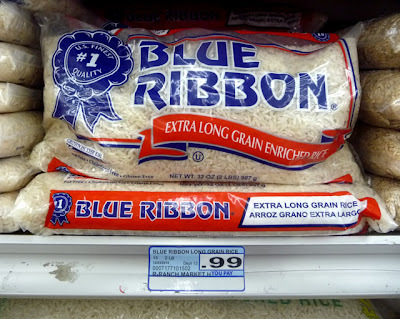 Eggs and packages of rice are cheap anywhere. If your store does not carry refried beans, add a tablespoon of oil to a hot pan and just use use a fork or potato masher on drained canned pinto beans (add a few tablespoons of the liquid from the can until the mixture is the consistency of chunky peanut butter). 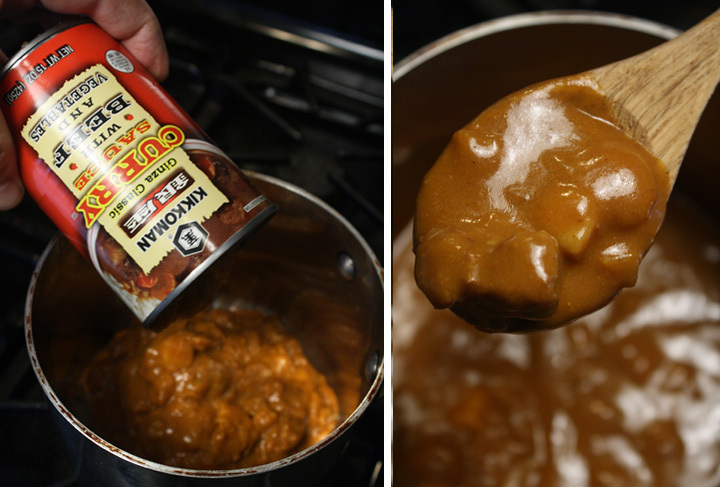 Of course, you can use heated whole pinto beans, too. I like it both ways. In a previous post I made Mexican Rice, so click here for that recipe. 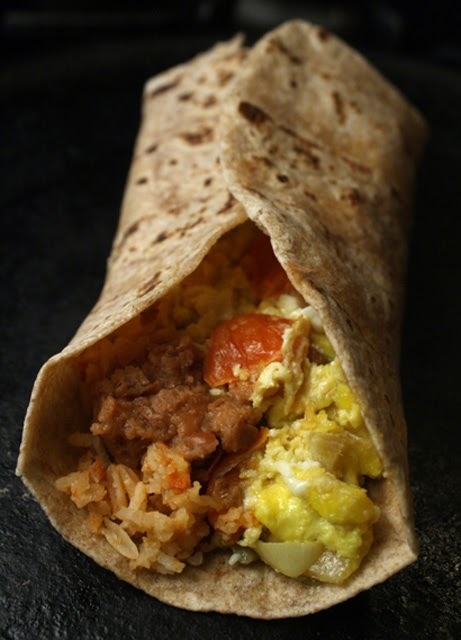 My Breakfast Burritos recipe is recession proof, and versatile -- so prepare scrambled eggs your favorite way, and just add rice and beans to make it your own. 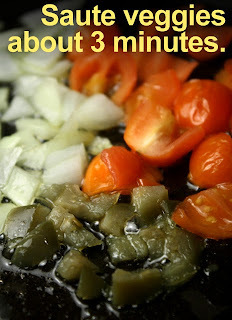 And open up that bottle of salsa to add extra heat! 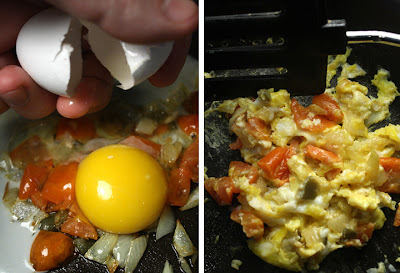 1 egg - scramble your favorite way, or see my Mexican Eggs recipe below. 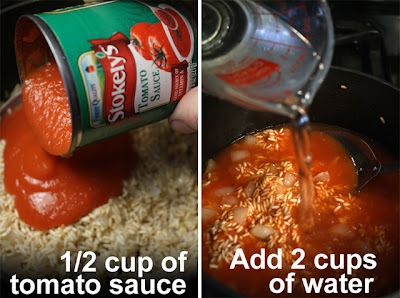 2 tablespoons Mexican Rice - okay to use regular rice. 2 slices of jalapeno - chopped fresh or from jar. Adjust amount to your heat tolerance. 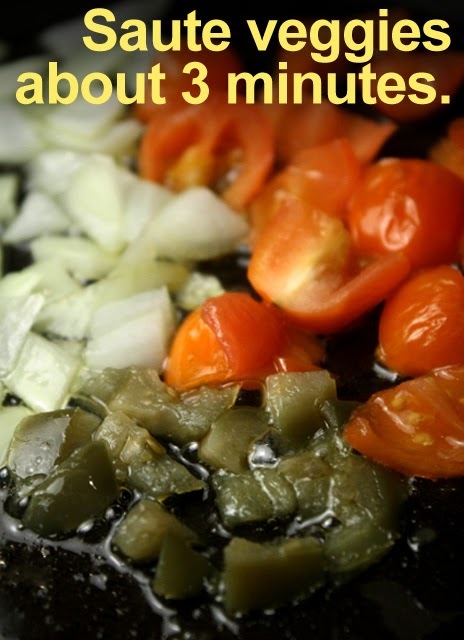 Heat oil in an omelet pan and saute onion, jalapeno and tomato for about 3 minutes. Add whole egg, season and scramble until firm, about 3 minutes. While preparing Mexican Eggs, heat tortilla in pan or on grill, over low heat, on both sides. No need to crisp up tortilla, it's ready when hot on both sides. 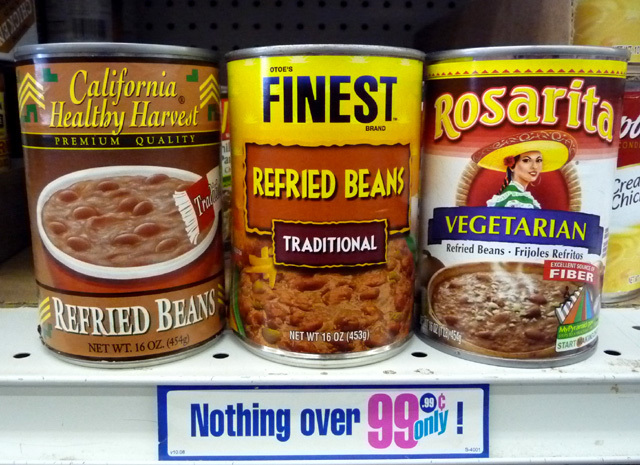 Also, microwave refried beans (with a teaspoon of water if beans dry out) and rice in separate bowls until hot. Cover and set aside. Ready to assemble when Mexican Eggs are done. Layer in rice, beans, and eggs and top with salsa (optional). If you have a favorite eggs scramble, try it! I like to add cheese, mushrooms or sundried tomato.